Land Rover has announced a series of updates to the Range Rover for its 2017 model year. The flagship SUV gains a suite of driver assistance technology, a new supercharged V6 petrol engine and a racy SVAutobiography Dynamic trim level. The flagship Range Rover SVAutobiography can now benefit from a new ‘Dynamic’ spec, tuned by SVO to give a sportier driving experience. Revisions to the suspension and an 8mm lower ride height, plus JLR’s latest adaptive dynamics and driver response system, aim to deliver greater agility. The Dynamic model is marked out by chrome quad tailpipes, unique graphite-coloured exterior detailing, red Brembo brakes and special alloy wheel choices, while inside there’s bespoke trim and upholstery. UK buyers also now get the choice of JLR’s 3.0-litre supercharged V6 petrol engine. With 335bhp and 450Nm of torque, it can shift the SUV from 0-62mph in 7.1 seconds while emitting 248g/km of CO2. To keep it in contention with the latest batch of high-tech German SUV rivals, the luxury 4×4 gains option packs with more driver assist systems. 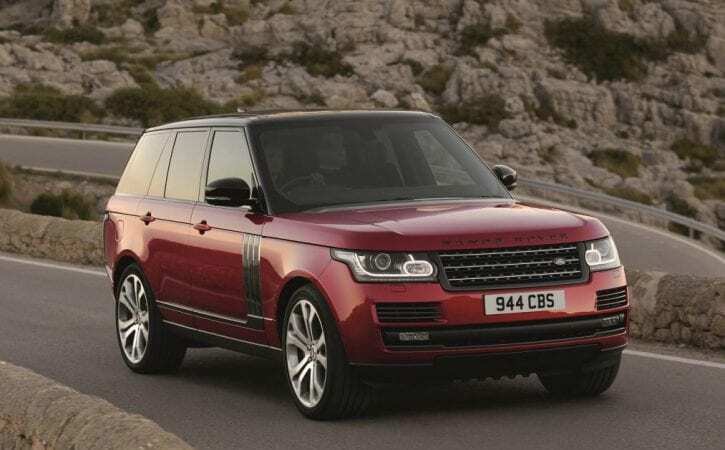 As standard the Range Rover will come with Autonomous Emergency Braking and Lane Departure Warning, while an optional Drive Pack brings a blind-spot monitor, traffic sign recognition and rear cross-traffic detection. That Drive Pack also includes a Driver Condition Monitor which analyses driving style to guard against fatigue. The Drive Pro pack adds further features including adaptive cruise control with ‘Queue Assist’ (autonomous driving in traffic) and ‘intelligent’ emergency braking. Blind Spot Assist and Lane Keep Assist can also apply corrective lock to ensure the driver stays in lane. Advanced towing assist and a new ‘Low Traction Launch’ mode for the Terrain Response system are added as well – it operates under 25mph to help the Range Rover get off the line cleanly in slippery conditions. Inside, Range Rover buyers can finally opt for the larger and more responsive InControl Touch Pro infotainment system – a 10-inch touchscreen which debuted across the Jaguar range and the new Evoque Convertible this year. It adds in Land Rover’s special ‘dual view’ tech for the Range Rover (letting the driver and front passenger see different displays) but retains features such as a WiFi hotspot, smartphone connectivity and the ability to connect to smartwatches. You can now control some of the car’s functions remotely via an app, while live services update you with real-time information when on the move.